This was the first of many exciting bridal shows in store for us this year in Durbs and it was the perfect way to start of the new year! 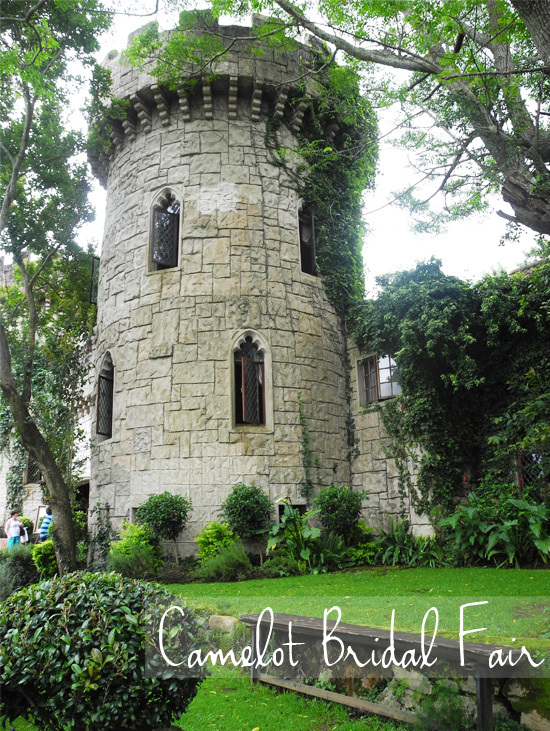 Camelot Estate in Hillcrest is absolutely beautiful - rolling hills, gorgeous stone work and a real life castle! We saw a lot of our old favourites at the bridal fair this year, as well as some exciting new vendors too. Find their very informative website here for all the information you would need to know. It will be no surprise to our regular readers to know that wedding all stationery is our first love. We were so smitten with the display put up by Simone of Very Inviting. Their work is so unique and contemporary. We absolutely adored all of it. Don't you just love the creative mobile name place card (pictured above, bottom left)? So simple and so beautiful. 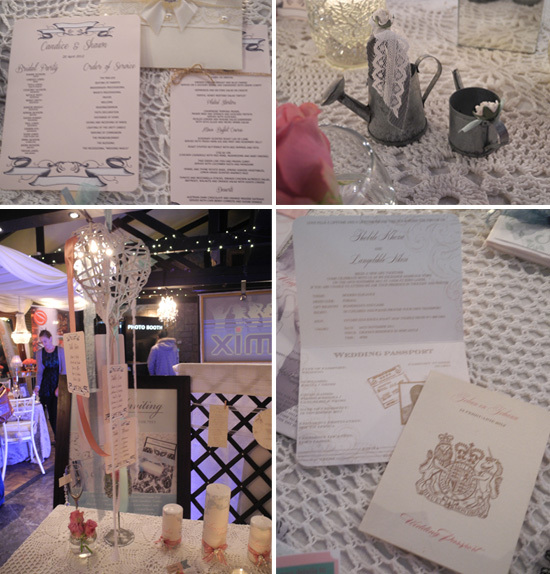 The passport invites were also impeccably designed and would be absolutely perfect for a destination wedding. Very Inviting offer a range of services including wedding invites, save the dates, gift bags, seating plans and frame hire. Check out the Very Inviting website here or get in touch with Simone at simone@veryinviting.co.za! We couldn't resist showing off the stand of one our favourite local flower arrangers / decor experts / venue hiring / wedding enthusiasts, Talloula. They never cease to impress us with the stands that they have on display at each and every bridal fair. 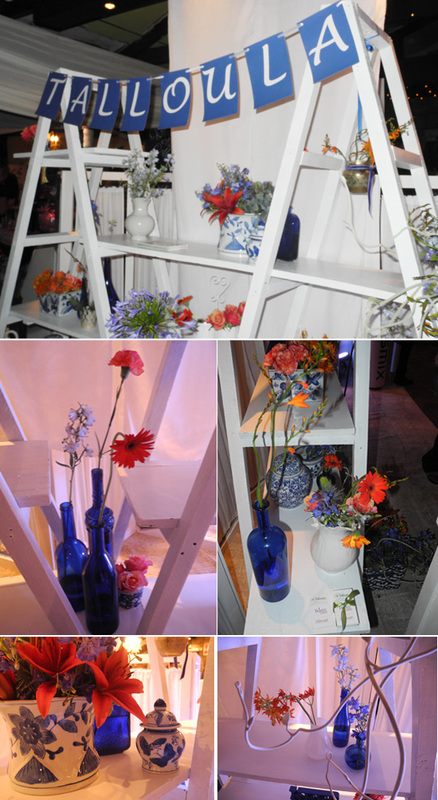 This was no different with blues and oranges taking centre stage against a stark white backdrop. Check out Talloula's website and Facebook page, and be sure not to miss their Starlight Movies Valentine Picnic - it looks like it will be just wonderful! We were blown away by the sheer impact this amazing display had. Lemon Tree Concepts is a function decor company that we have never seen at a bridal fair before (where were we looking?!) and we thought their table design was beautiful. The floating daisies were artfully hung above a table brimming with open and closed white roses, crystal held candles and elegant silverware. We loved the classical beauty of this design and we can't wait to see what other displays they have in store for us in the near future. Find out all you need to know about Lemon Tree Concepts on their website here or contact Steve at steve@lemtree.co.za. It was absolutely impossible to walk past this stall and NOT stop. The chocolates on display looked absolutely gorgeous and with all the variety available, a good stop and stare was needed. And of course, a good taste. 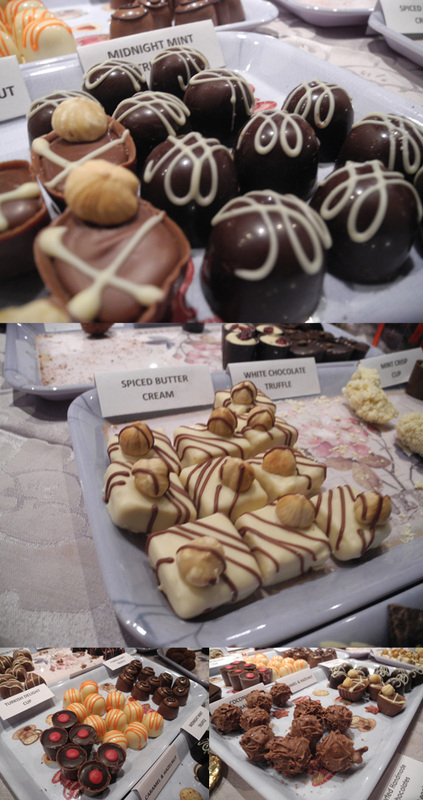 We tried to restrain ourselves and went for one chocolate each - the caramel truffle. *Drool*. These chocolates are all hand-crafted with love and professional craft. Their branding is supreme which is a huge tick in our books. Stuck for favour ideas? Definitely consider de Fleuriot for something unique and delicious. See their website here and be sure to consider them for your next hostess gift! Well, if that was the first bridal show of the year, then the benchmark has been set pretty high. We can't wait to see what the other bridal fairs have in store for us this year. Pictures taken with the permission of the vendors. Please note that we covered these vendors out of our own free will. We were not paid or reimbursed in any way.